England will hand Kevin Pietersen the chance to resume his one-day international career on Tuesday when they name a squad which will blend experience and youth for the demanding return series in India next month. 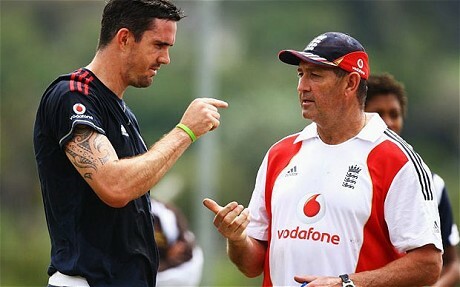 Pietersen missed the recent 3-0 series victory over India due to a wrist injury and the managementâ€™s decision to rest him before the winter. There have been concerns over whether Pietersen remains committed to playing 50 over cricket for England and with a string of young players ready to step up his future is far from certain. He disappointed Andy Flower by returning home early from the World Cup to have hernia surgery and his recent form, an average of 22 since the start of 2009, in the 50 over format hardly demands selection. But the tour to India against a team that is likely to contain the star names who missed this summerâ€™s hammering in England is the kind of trip that should appeal to Pietersenâ€™s love of the big stage. A demanding trip on and off the field to India will also be a useful gauge for Flower to see whether Pietersen still has the desire to play all three formats of the game, a situation the player maintains is still the case. Jonny Bairstow, the Yorkshire wicket-keeper batsman, will be given a chance to further impress while Durham leggie Scott Borthwick should accompany Graeme Swann and Samit Patel as spinners on the trip. Any temptation to pick a more experimental side may well have been discarded by the selectors after watching an inexperienced England team slide to 88 all out against the West Indies on a slow turner at the Oval. â€œWeâ€™re pretty clear about what we want and why, I donâ€™t think thereâ€™s going to be much confusion in that regard,â€ said Flower of the selection for India. England play five one-day internationals and a Twenty20 on the tour and leave for India next Monday, barely a week after completing their season at home against the West Indies. England have lost their past two one-day series in India 5-0 and 5-1.